Apply For Girl Up Leadership Summit In Washington, D.C Apply Now for the 2018 Girl Up Leadership Summit in Washington D.C.
Join hundreds of young leaders from across the U.S. and around the world. The 2018 Leadership aims to achieve global gender equality by building a diverse, inclusive, and active movement. 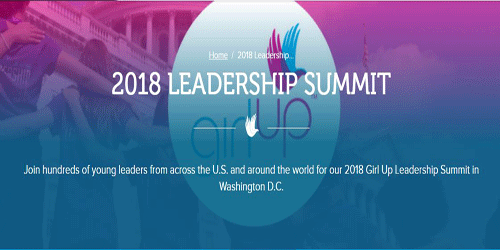 From July 8-11, 2018 more than 350 passionate youth advocates from around the world will convene for the 7th annual Girl Up Leadership Summit in Washington, D.C. For three jam-packed days, these young change-makers will participate in leadership training, learn from influential speakers, engage in skills-based workshops, and lead an official lobby day on Capitol Hill. Applications for Financial Assistance and Scholarships are open now. 0 responses on "Apply For Girl Up Leadership Summit In Washington, D.C"